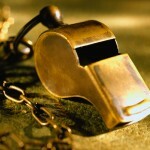 The law provides vigorous protection for Whistleblowers. For example, the federal False Claims Act prohibits an employer from retaliating against you for attempting to uncover or report fraud on the federal government. If retaliation does occur, you may also be awarded “all relief necessary to make the employee whole,” including reinstatement, back pay (two (2) times the amount of back pay,) litigation costs, and attorney fees. The Department of Labor (DOL) administers fifteen (15) whistleblower provisions that protect employees who disclose information about violation of laws pertaining to airline, trucking, nuclear, environmental, rail, and workplace safety. The Dodd-Frank Act protects Whistleblowers who report violations of securities laws to either the SEC or Commodities Futures Trading Commission. The Act also protects employees who report fraud relating to a consumer financial product or service to the Bureau of Consumer Financial Protection. Federal employees can pursue a retaliation claim under the Whistleblower Protection Act (WPA), which prohibits federal agencies from retaliating against federal employees who engage in whistleblowing activities. In addition, Congress recently enacted whistleblower protections for contractor employees, and employees of state and local governments, to safeguard against fraudulent spending of stimulus funds. Many whistleblower protection laws prohibit a broad range of retaliatory actions, including demotion, termination, denial of benefits, failure to hire, failure to promote, intimidation, reassignment, and any other discriminatory action that would negatively impact the terms and conditions of the Whistleblower’s employment, or would dissuade a reasonable person from engaging in further protected conduct. Employees alleging whistleblower retaliation against an employer should retain experienced counsel as soon as possible, because many whistleblower retaliation claims have a short statute of limitations.